SPAIN: Suprem Court considers a FX Loan is a derivative financial instrument related to foreign exchange. Directive 2004/39/EC, usually known as MiFID (Markets in Financial Instruments Directive), is applied to this legal transaction. Known as ‘multi currency mortgages’ in Spain, it’s a serious problem for many loans borrowers. Spanish Suprem Court, under the Presiding Judge Rafael Sarazá Jimena, has delivered an important judgement related to FX Loans. Although the Court failed against the retail client because it’s considered that he had an expert profile, the judgment establishes the nature & characteristics of this transaction as well as the applicable norm. This way, the exchange currency chosen applies not only to the Euro amount of the instalment but also to the establishment of the outstanding principal amount in Euros. This implies that, despite paying periodic amortisation instalments, it could well be that after several years the borrower not only has to pay higher instalment amounts in Euros, but also owe the lender a greater capital sum in Euros than they received to arrange the loan. The Supreme Court mentions also the issued Directive 2014/17/EU of 4 February 2014 on credit agreements concluded with consumers for residential real estate. However, the transposition deadline has not yet passed in Spain, and is therefore not applicable in this case. Nevertheless, Directive 2014/17/EU refers to existing problems “regarding the irresponsible granting of loans and contracts, as well as the potential margin of irresponsible behaviour among market participants,” such that “some of the problems identified derive from foreign currency loans signed by consumers because of the advantageous interest rate offered, without information or adequate understanding of the exchange rate risk entailed”. As a derivative financial instrument related to foreign exchange, it is included in the scope of MiFID. In this case, the bank violated its obligations imposed by MiFID. The Court considers that the “multicurrency mortgage” is, in terms of a loan, a financial instrument. It is also a derivative financial instrument in that the quantification of one party’s obligation to the contract (the payment of the loan repayment instalments and the calculation of the outstanding capital) depends on the amount of some other distinct value, called the underlying asset, which in this case is a foreign currency. As a derivative financial instrument related to foreign exchange, it is included in the scope of the Securities Market Act [=MiFID]. The failure to perform the duties of information that the general and sector rules impose on the banking entity allow presumption that the customer lacks sufficient knowledge of the contracted product and associated risks, which would vitiate consent, but such presumption may be rebutted by proof that the client has the right skills to understand the nature of the product being contracted and the associated risks involved, in which case the relevant information asymmetry no longer applies that justifies the obligation of information imposed on the banking or financial institution and which would justify the excusable nature of customer error. 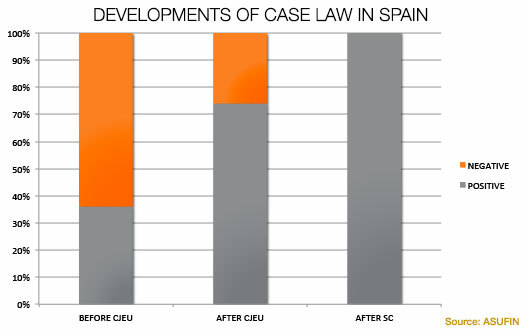 The development of case law related to FX Loans in Spain has one clear turning point: the CJEU Judgement C-26/13, also known by Árpád Kásler. Since then the number of judgements against banks has increased significantly. It is still too early to know how it will influence the Supreme High Court, but it seems to be that it will be very positive for retail customers. Since its delivered in July, there has been 5 judgments in the first and second instance, all of them have failed against the bank. We publish today the English version delivered by ASUFIN of this judgment with the hope its influence reaches other countries in Europe. The president of ASUFIN, Patricia Suárez, will speak next 10th at the Global Legal ConfEx 2015 at the London Law Society about this judgement. financial instrument related to foreign exchange pe Google.